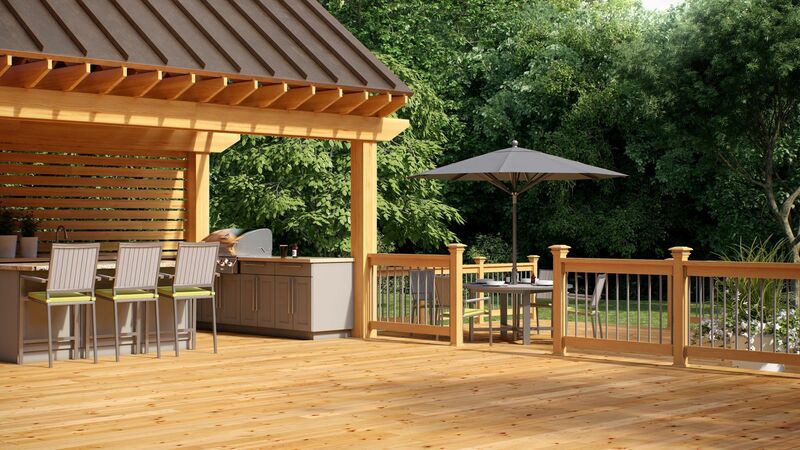 From most vantage points, the vertical elements of a deck are more visible than the horizontal decking. 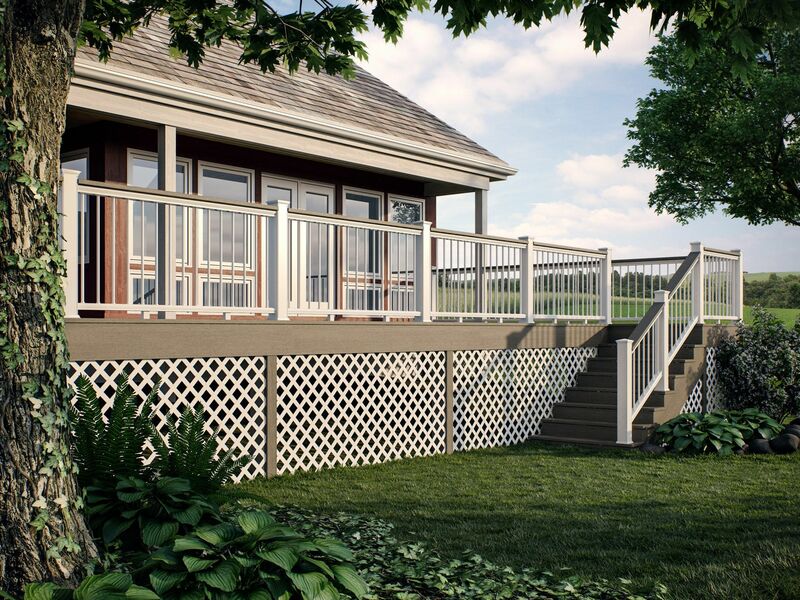 That means that the railing you choose defines the look and style of your deck. 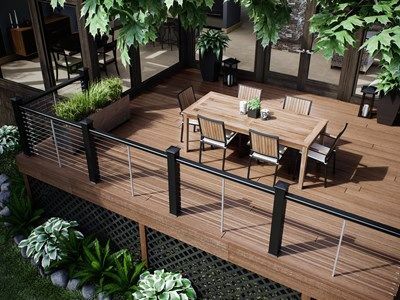 This article takes you on a quick tour of the most common design approaches to deck railings. Of course, you need to keep practicalities in mind. Railing codes are designed to ensure that your railing is strong and free of openings large enough for a child to slip through. Read these railing codes if you want to know more. Fortunately, most of the railings shown here use manufactured components (and may come in a kit) that automatically create railings to meet national and local codes. Before you choose, research ow expensive the railing will be, how difficult it will be to install and how much work will be required for maintenance in years to come. This article will touch on those topics, and you’ll find more detailed information in other articles on Decks.com. Railing manufacturers supply all the parts you need, including connectors. 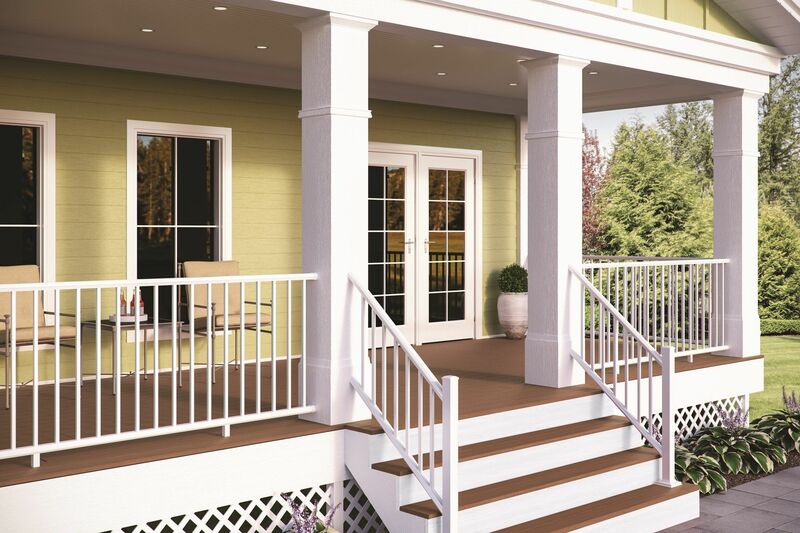 Individual railing parts, like balusters or graspable stair rail, may come in kits with pre-drilled pieces to speed up installation and help make spacing easier. You can also mix and match components - or combine manufactured parts with wood parts - to create a look all your own. All the non-wood components shown on the following decks are made by Deckorators, a company that pioneered metal railings and deck pieces. 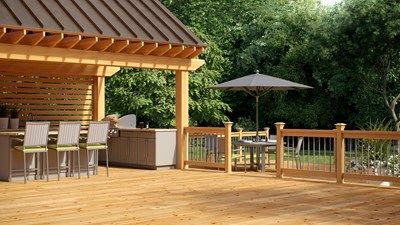 Using their parts will ensure a railing that is not only strong and the correct size; it will also be easy to keep clean, and will not need to be stained or painted. Many railings include lighting. These are most often placed on the tops of posts, but can also be installed on the sides of posts, or even on balusters. When installing lighting on a wood railing, you will need to cut holes and channels to run the wires. With metal and vinyl components, you can usually simply run the wiring inside the post sleeves, with little or no cutting required. 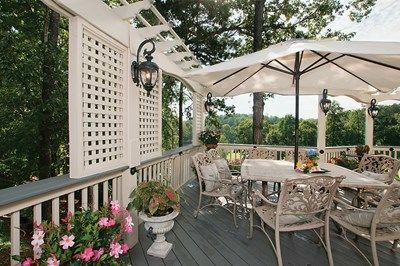 Railings don’t fit neatly into standard architectural categories like “Victorian,” “Cape Cod” or even “Modern.” You will probably have trouble finding a railing that perfectly matches your house’s style. Instead, spend some time finding parts and creating a railing style that will both complement your home’s design and stand out on its own. Depending on the view from your deck and from inside your house, you may want a railing you can look through with minimal obstruction, or you may prefer a more solid railing that calls attention to itself. 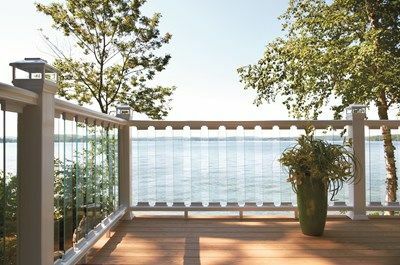 This all-wood railing uses standard lumber such as 2x4s, 2x2s and 4x4s to create the gently-angled geometric frame around the deck. 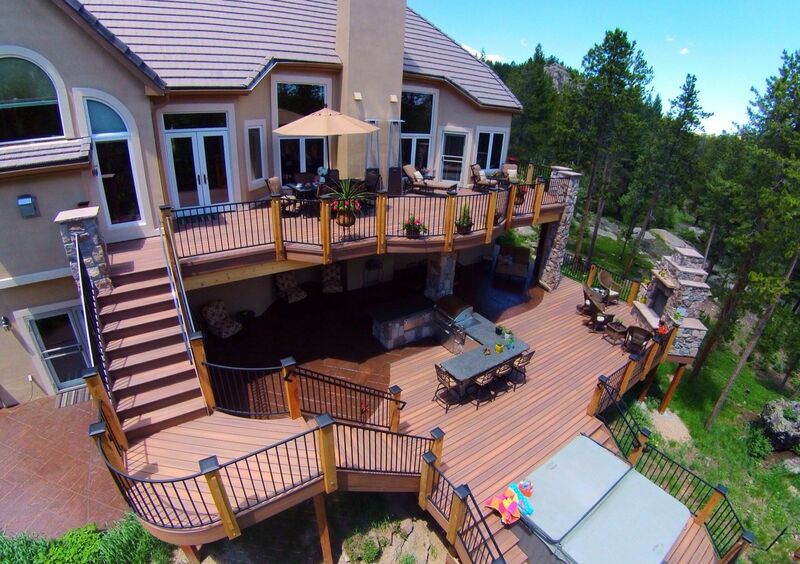 A street view showcases the vertical elements of this deck, especially the railing and lattice skirting. The railing combines metal and vinyl parts in colors that match the stairs, decking, fascia and lattice skirting for a crisp, clean look that pleasantly complements the house trim. Since the balusters are thin, the view is only partially obstructed. A railing with 4 1/4-inch-wide tempered glass balusters is the next best thing to a window on the world beyond, creating an open, airy effect. (You could install large glass panels instead.) Surprisingly, the glass is strong enough to meet most building codes, and easy to install. This railing repeats the glass theme with lantern-style solar post lamps, which complete the look with sundown sparkle. The classic lines of this railing resemble a wrought-iron fence, but the railing is actually aluminum with a sturdy powder coating that will not need to be repainted for a long time. Most of the parts are pre-cut, and those that aren’t are almost as easily cut as wood. A sleek cable railing satisfies codes and protects people from falling, but barely inhibits the view. 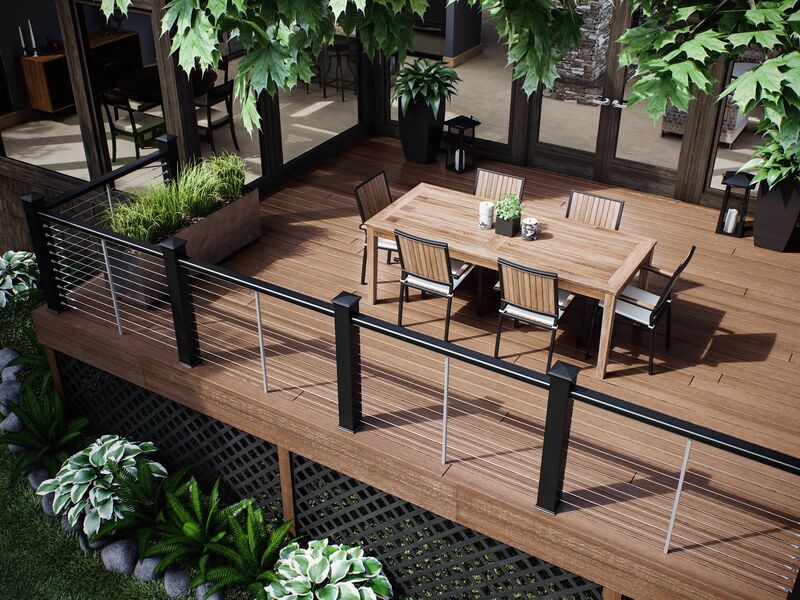 This one combines black and silver components for a classic yet contemporary look that harmonizes beautifully with the deck’s furnishings. A railing like this is usually best installed by professionals. Here the timeless wrought-iron fence look features balusters with a delicate twisty spiral. 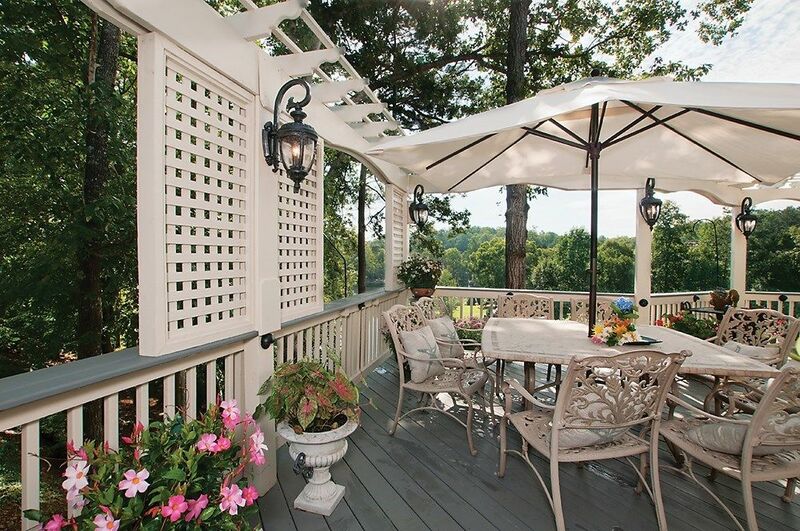 One could argue that a handsome railing like this actually improves the view, by supplying it with an appealing frame. These handsome baroque-style arched balusters are richly ornate, yet also exude a sense of strength and solidity. Here all the parts - post sleeves, rails, rail supports and trim - are aluminum rather than vinyl. They cost a bit more, but the quality shines through. 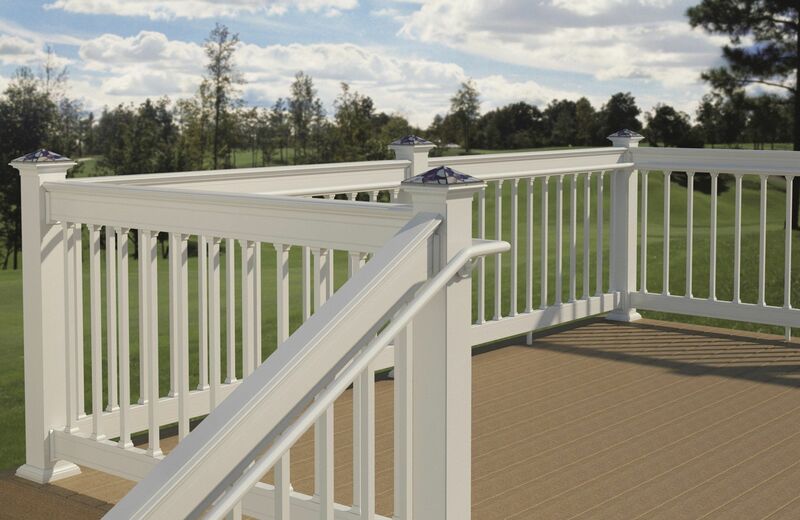 These balusters are face-mounted onto the sides of the rails, but could also be installed between rails, like the balusters in the next photo. This minimalist railing with slender components is attractive in a no-nonsense way, and lets the home’s trim elements be the star of the show. When the parts are as slim as this, they need to be metal rather than vinyl. Most of the railing parts on this deck are wood, but not standard dimensional lumber with rounded edges and knots. 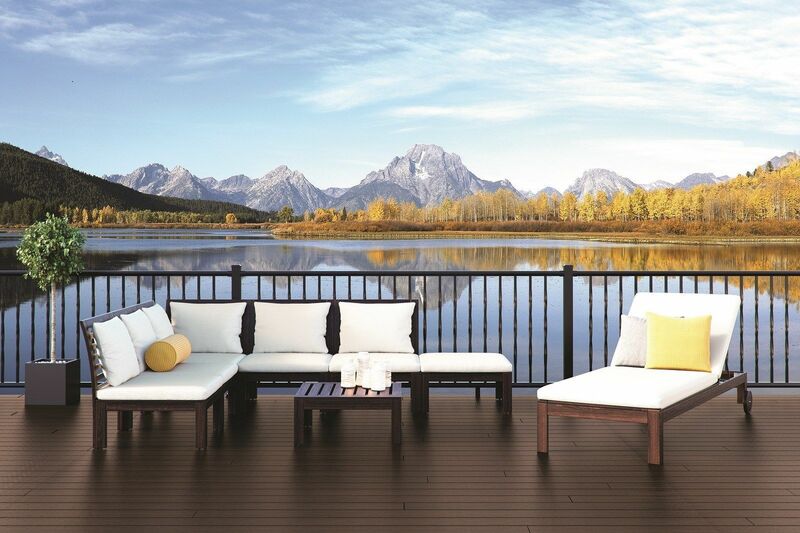 This high-end wood has crisp edges, no knots, and is perfectly straight, for a warm and elegant effect. The thin gray metal balusters are painted to match the chairs and cabinetry. 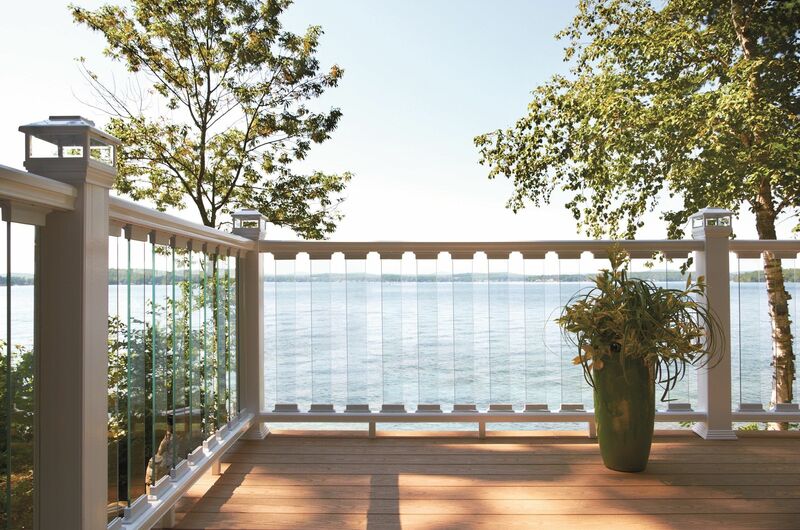 This all-white aluminum railing, accented with Tiffany-glass-style post caps, may at first glance look similar to less-expensive PVC railings. But because it is made of aluminum, the corners of all the parts can be crisp rather than rounded, and the connectors can be smaller and less bulky, which makes the railing feel classic, where a PVC railing might feel cheap and clunky. 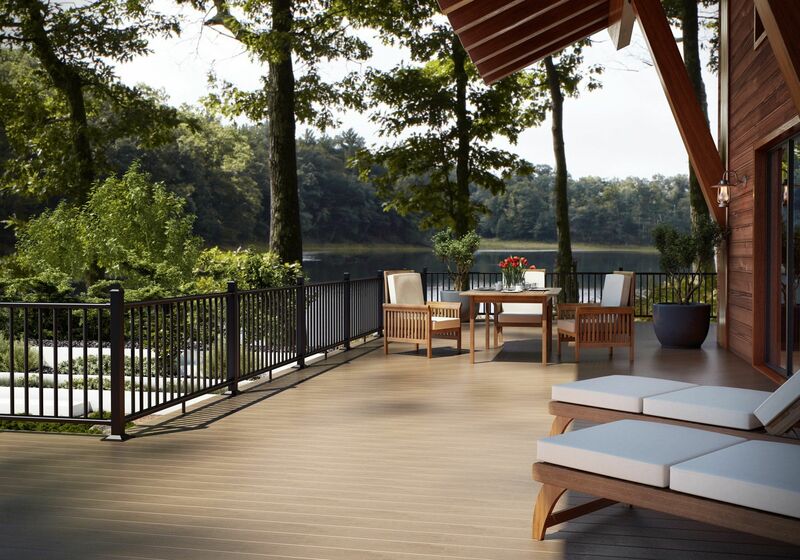 Here’s an attractive solution for adding privacy to a deck. Lattice panels have a substantial homemade feel, and the overall effect is dignified by the addition of a slender overhead structure. 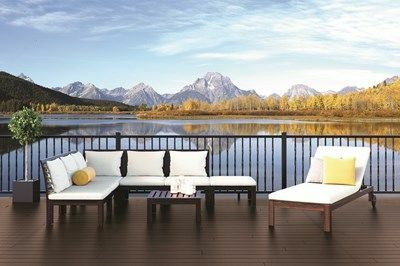 Most of the parts are made of painted wood, but the railing’s top cap is the same sturdy composite as the decking, so it can withstand weather and handling without need for repainting. In a setup like this, the posts are installed first, then a metal fabricating company comes out to measure and make the railings to fit between. Black metal post caps are a stylish choice to punctuate the rambling lines of this deck’s outline, and are especially noticeable from the deck’s upper level. Branch railing like this is popular in Western states. Be sure to consult closely with your inspector to make sure your components and fasteners will make the railing strong enough to meet code requirements. Wood 2x2 balusters can be installed in fanciful geometric arrangements, as long as they are fastened securely. 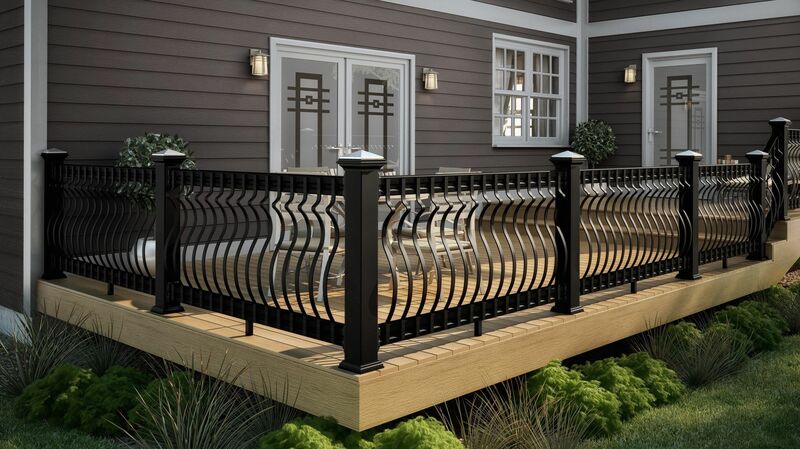 This railing features a top cap that is raised two inches above the top rail to enhance the geometric effect. These posts definitely have the look of natural stone, but are actually easy-to-install resin post sleeves covered with faux stone. They simply slip over 4x4 wood posts, and a variety of top and bottom rails can then be easily attached with provided hardware.